"La Miniscuola 1,2,3 Via" AUTHORIZED by the town council of Rome, is the result of 40 years of experience in children's education. "La Miniscuola 1,2,3 Via" is situated in a villa surrounded in the greenery of Eur. The three floored building is enclosed by two outdoor areas; one in the heart of a pine forest, and the other; a large terrace equipped for the children of the nursery. Our school environment is scientifically organised to stimulate and captivate the child's interest in learning, working, creating and exploring, inorder to intertwine school environment with the lifestyle of the child, joyfully engaging the child day by day in the activity of practical life, by improving motor skills, independence, responsibility and communication. calm and harmonious, in order to facilitate an environment where the child can express freely their interests and experiences. Appealing and enticing, stimulating the child to appreciate creativity in order to nurture qualities of kindness, harmony, friendship, care and attention. The one person, one language approach (OPOL) is a method mini scuola uses in order to teach children the english language. With OPOL, each educator speaks in their native language when communicating to the child. Children quickly learn to associate the particular language with the appropriate educator. Therefore our program uses resources such as videos, films, books, songs, memory cards etc. in both the english and italian language. The school grounds allow children to explore various activities, from the use of fine motor skills to movement, painting to general play , exploring fairy tales to dress up; all to promote harmonious growth in the child. The importance of nutritious meals provided should also be stressed . Healthy, natural, and a variety of meals are always prepared with fresh and quality food from our cook. 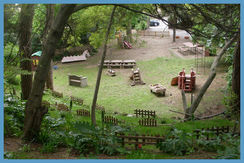 2 big gardens with trees equipped for outdoor games . The school is opened from Monday to Friday from 7:30 to 18:00 p.m.
A partir de este año hemos introducido el español como segundo idioma. Los niños pueden descubrir nuevas palabras y aprender jugando algunas estructuras gramaticales básicas. Juegos, canciones y actividades basadas en la metodología de la respuesta física total (TPR) son los elementos principales de nuestro enfoque educativo.